At its core, Kodi is an unbelievably powerful application. When it comes to home theatre software, you can hardly find a viable alternative to Kodi (not that we haven’t tried). This is because it supports almost every popular platform, plays various types of media files, and finally – comes free-of-charge. However, an important side of this application is its freedom of customization. Out of the box, Kodi is a highly polished software, ready to be used on its own. Still, you can push it a couple of steps further via amazing third-party Kodi addons, builds, and skins. With this said, TechNadu will present a list of the very best Kodi skins. 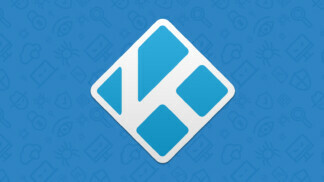 We will be talking about how to change Kodi’s UI (user interface) without making any deeper-level changes. In fact, it’s incredibly easy to switch between different skins and install new ones. Therefore, we’ll take a look at the best Kodi skins that work across different Kodi versions and platforms. Let’s jump right in. As you know for yourself, Kodi 18.1 Leia has just been released. However, it supports a limited range of skins at the moment. Therefore, we’re going to include a short notice for each of our recommendations, so you can easily find the currently supported skins. Also, all of our recommendations work with Kodi 17 Krypton as well. First, we will show you the most popular options at the moment. This list will help you save some time that you’d spend browsing and trying out different options on your own. Our list of the best Kodi skins contains entries that bring polished interfaces and that are fully working as well. Compatible With: Kodi 17 Krypton. We’ll start our overview of the best Kodi skins with probably the biggest name in the community: Aeon Nox. This skin has been around for quite some time, following several major Kodi releases. Since every new major release requires skins to be updated, Aeon Nox is usually the first one to arrive. This is a fully-featured skin that can completely transform the way you use Kodi. First and foremost, Aeon Nox put a big emphasis on large visuals. Your movies and TV shows are present as a grid of posters that you can navigate in several different ways. Once you enter a bit deeper, you’ll get to see plenty of information about every title in your library. This applies to music, TV shows, as well as music. Don’t worry, your photo gallery, as well as your addons, will also have a fresh feel to them. All in all, a highly capable skin with lots to offer. As its name implies, this skin is all about modularity. In case you’re an older Kodi user, you probably remember skins such as LightBox and nBox, which were hugely popular in previous Kodi releases. Well, the BOX skin is a combination of those with a hint of unique aesthetics as well. The most interesting thing about BOX is that it provides straightforward navigation. Instead of lines of text, you’ll see prominent icons with interesting iconography. Also, this skin uses different types of navigation for different types of content. This means that your movies can be previewed as a grid of posters, while your music can be a long list of artists and playlists (along with meta-data, ratings, and more). Our list of the best Kodi skins wouldn’t be complete without Titan. In fact, this has been one of the most beloved skins of our editorial team at TechNadu. That’s because it strikes just the right balance between simplicity and providing plenty of information in a clear way. In other words, lots of things can be happening on the screen without overwhelming you. Similar to how our previous suggestion works, Titan is also about modulatory. This means seeing plenty of large icons and grids of movie posters. We also especially like how the main navigation bar can be customized. If you like prominent categories, you can display them as a scrolling menu. Or if you have a smaller screen, you can shrink them and see more of those at once. Plenty of customizations await that will keep you busy for a long time. Compatible With: Kodi 17 Krypton, Kodi 18 Leia. We have decided to put Confluence on our list of the best Kodi skins due to its significance to the Kodi user community. This has been the default skin for numerous Kodi releases, which is why users of this application still miss it. However, you can easily install this skin and restore the appearance of your Kodi to its earlier state. Confluence is based on visually heavy elements with lots of shiny UI elements and plenty of gradients. So, this isn’t the right skin for you if you’re into modern and minimalistic skins. The main menu is vertical, with sub-categories displayed as well. This makes navigating the application as easy as possible. 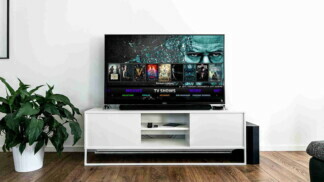 In addition, this skin uses meta-data of your movies, TV shows, and other types of content to display plenty of useful information for each title. When it comes to something completely new and exciting, we have the GRID. This is a fast-developing skin with a very active team behind it. It even works on the newly introduced Kodi 18 Leia. A lot could be said about the GRID. Into transforms the main menu into a horizontal transparent column on the left side of the screen. As you scroll, you’ll get to see beautiful visuals in the background. If you, for example, enter your TV shows category, you’ll see a horizontal list of titles, along with how many episodes you didn’t watch. Of course, you can transform this into a vertical scrolling bar with metadata displayed at the bottom. The GRID is popular due to its high level of customization, making us sure you’ll manage to create something unique. Aside from Kodi’s Estuary skin, Amber is one of the most popular ones. This is because it offers amazing looks in addition to high levels of customization. By default, Amber brings a horizontal menu with the main categories visible straight away. As you scroll through different categories, you’ll see high-resolution images in the background. These will be based on your Kodi’s content library. Once you get into a specific category, like Movies, you will see a nice horizontal row filled with movie posters. However, almost everything about Amber can be customized – which is why we have placed it at the top of our list of the best Kodi skins. If you’re not a fan of the horizontal navigation, you can opt for a vertical main menu. This will automatically employ grids of artwork and movie posters so you can see more at once. In specific categories, you won’t see a row of posters, but instead a grid or a list of available titles. This Kodi skin is somewhat similar to our previous suggestion. The main difference is that Mimic is built upon the principles of flat design. What this means is that you won’t see too many shiny buttons or gradients. Instead, the main color is blue and its different hues. As you can imagine, you can change the default color and adjust Mimic’s appearance to your sense of aesthetics. Perhaps the most interesting aspect of this skin is its customization. There are numerous options to review and adjust. For example, there are different ways this skin can display movie posters. Our favorite choice is a display option called ‘Wall’ which is a grid of posters without any border. Instead, you’ll see nicely stacked covers of your music, videos, and TV shows. If you prefer something simple, you can go for a basic list option. This allows you to see a vertical list of your content in addition to its artwork, synopsis, and ratings. There are also horizontal lists which may be more suitable for large TVs. Our list of the best Kodi skins would not be complete without at least one Material Design skin. This kind of aesthetics was brought by Google a couple of years back. Since then, it has found its way to numerous different platforms since it brings very clear and concise visuals. There are no gradients or other heavy elements. Instead, you’ll see basic colors and buttons without transparency. 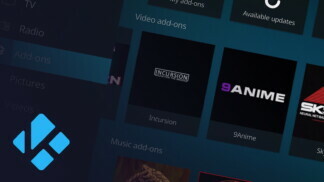 The Unity skin does a good job of bringing Material Design to Kodi. The main menu is, by default, organized into a horizontal menu. It is basically a large gray bar with white-colored letters and menu items. As you scroll through the items, you will see related apps (add-ons) as well as movie posters and artwork in the upper portion of the screen. As you’ll see, everything is card-based, meaning that you’ll see small and large rectangles filled with different kinds of information. This skin also allows you to create shortcuts to your favorite types of content. For example, you can pull out a category of cartoon add-ons, Chinese movies and TV shows, or incredibly fun Korean movies and variety shows. Don’t forget to check out Unity’s settings within the System Menu > Interface Settings. There, you can switch between different color schemes and different ways of presenting your content. If you’re not into clear-cut and flat design visuals, Black Glass Nova might offer a solution. This is a highly customizable skin that brings everything you might possibly need. By default, Black Glass Nova transforms Kodi’s menu into a horizontal bar with large thumbnails. As you scroll left or right through different content categories, you’ll see images of what each category represents. While browsing the main menu, you’ll also see sub-menus at the bottom of the screen. For example, the Movies section comes with sub-menus that contain Playlists, In Progress, Recently Added, and more. There are many ways to browse your content, which is where this skin excels. When it comes to is visuals, it could be said that Black Glass Nova is built upon Windows’ Aero aesthetics – if you remember that term. Dialog boxes, content sections, and images come with a transparent border with soft edges. Since there are numerous small details, our recommendation is to use this skin on a large-screen device. Otherwise, Kodi’s interface might be a bit overwhelming. This is an incredibly user-friendly skin. As it seems, the main mission of Nebula is to bring as many options as possible and make them visible all at the same time. However, Nebula isn’t too complex since it doesn’t make the navigation too difficult to handle. In fact, it makes incredibly useful compromises. The Home Screen of Kodi, once Nebula is applied, turns into a soft white surface with gray text. The central portion of the screen is dedicated to the main menu, which can be scrolled left or right. Once you pause at a certain category, you’ll see different options at the top and bottom of the screen. For example, you can directly enter a certain movie genre without having to enter the main category first. 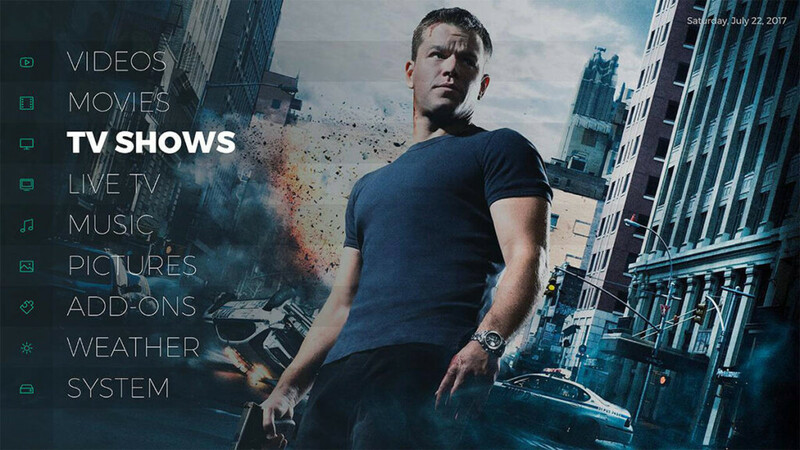 Once you click on a movie or TV show title, you’ll be taken to a nicely designed overview. You can see numerous details including information about a particular media file, synopsis, artwork, and a large header image. If you’re using HD video addons, they will truly shine through every screen of this skin. Just like other best Kodi skins, this one can also be customized, which means that almost everything about it can be changed. 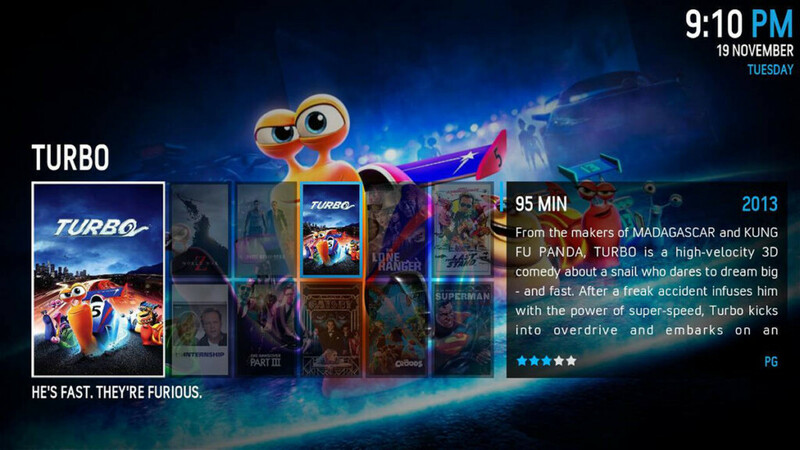 Metropolis pushes the boundaries of Kodi’s customization. This incredible skin transforms Kodi into the ultimate media center. This is what makes Kodi better than its competitors. This skin is all about presenting a lot of information about your media collection. For example, if you enter the TV Shows category, you will see how many episodes are stored and how many of those are waiting to be watched. In addition, you can see your recently added files at the bottom of the screen. Another interesting thing about Metropolis is that it brings a lot of freedom. You can change the default layout in many different ways, and choose between different gallery-mode options. For example, you can pick horizontal or vertical sorting. We also like custom logos for TV shows. Once you enter this section, you will see a list of your locally stored TV Shows along with their logos and artwork. This is a bit different than with other skins on this list. When it comes to dramatic overhauls, Metropolis is the best Kodi skin. After telling you about one of the most dramatic skins, let’s switch to something simplistic. This is where Arctic: Zephyr comes into play. This is an extremely polished skin that can easily replace Kodi’s default option. By default, this skin turns Kodi’s menu into a large, bottom-positioned bar. This is where you’ll see the main content categories, but you can also add shortcuts on your own. As you switch between different items, you’ll see that a large background image changes. Enter any category, and you’ll see a clean representation of your content. You can switch between different viewing options. For example, your movies can be presented as scrollable lists of posters or as text-based lists. No matter what option you pick, you’ll also see legible letters and a nicely designed layout. In case you watch live TV via your Kodi, you should know that Arctic: Zephyr brings an incredibly nicely designed TV schedule where you can check out upcoming content. Even though not everyone will like this skin, we simply must mention Chroma on this list of the best Kodi skins. This is because Chroma has been available for quite some time and managed to attract a loyal user base. It might be too overwhelming on smaller screens, but Chroma works just fine on larger screens and TVs. By default, Chroma combines a horizontal menu with high-resolution background images. If you enter a category, you will see all the needed information. For starters, there’s a list of available content, in addition to ratings, genres, synopses, and artwork. As you can imagine, there are different ways to organize how the content is displayed. It can be via lists (horizontal and vertical) and different kinds of grids. 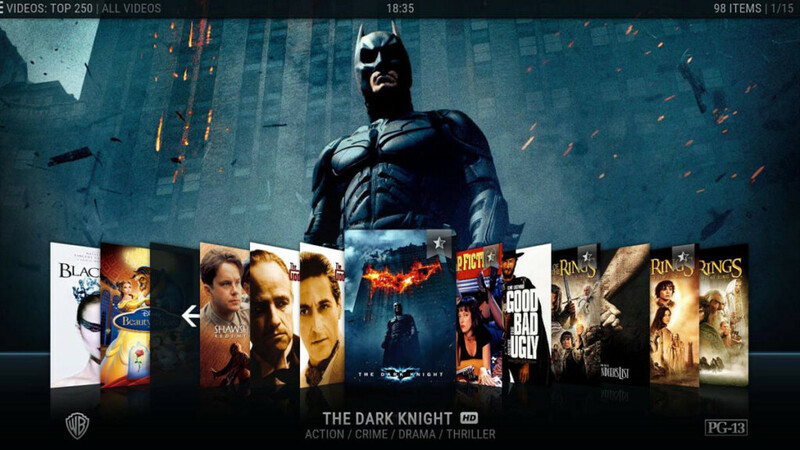 There’s also an option to show all your movies at once as a large interactive wallpaper. The only thing that we’d like to see improved is legibility. At times, it can be hard to read something, especially if there’s a white background. 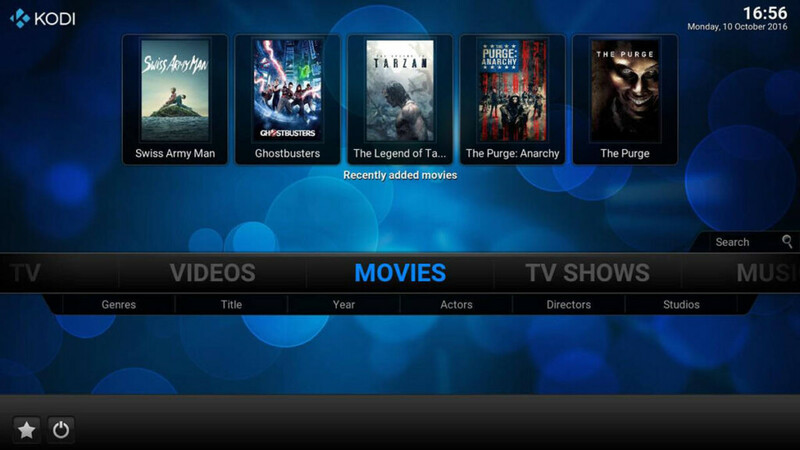 Eminence turns your Kodi into something that resembles LG’s WebOS. You can recognize it by a row of oddly shaped icons that can be scrolled left and right. However, this skin does an incredibly good job of creating a simple yet functional user interface. As previously said, Eminence brings a row of large icons on the Home Page. As you enter one of the content categories, you’ll see a large grid of movie posters and artwork. However, you can turn this into a scrollable horizontal list consisted of a large image and synopsis. There are different variations to how you can present your content library. This skin also does a good job of simplifying Kodi’s Settings menu by bringing clearly visible icons. The text is often separated into blocks placed within their own background. This means that you can read synopses and other information no matter the background. We placed Eminence on your list of the best Kodi skins due to its simplicity, ease of use, and fluidity of navigation. Try it out. As its name says, this is the sixth generation of Bello. Without saying, you can realize how popular this skin is among Kodi users. And there are numerous reasons for this. Bello 6 is a brilliantly designed skin that overhauls your favorite media player into an elegantly designed software. Bello 6 brings very subtle typography and plenty of subtle animations. Therefore, it looks amazing on large-screen TVs. However, you should know that the skin is also fully functional on smartphones and tablets. 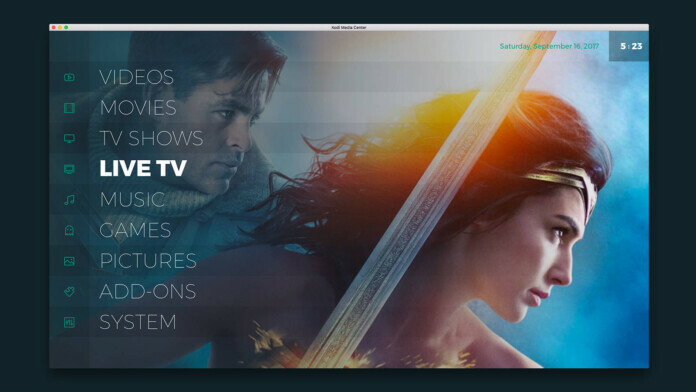 In case you’ve populated your Kodi with movies and TV shows, you will get to see large movie posters and plenty of additional information attached to them. 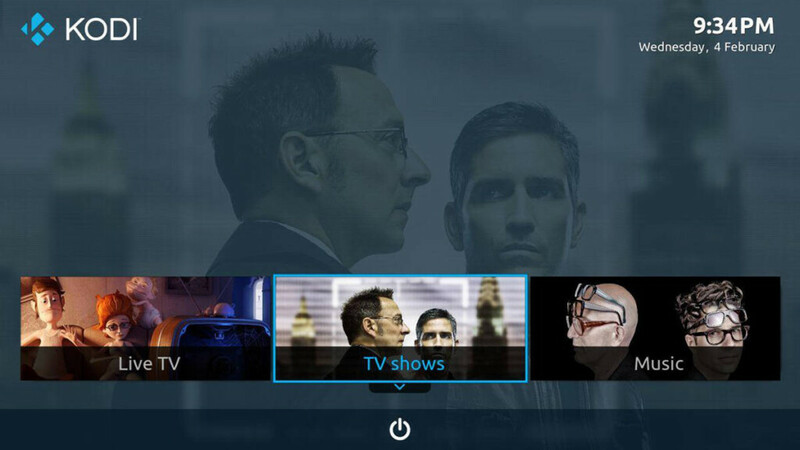 The skin also brings a highly polished TV guide, in case you’re using your Kodi to watch TV. This list is focused on the very best Kodi skins. You can find more options within Kodi’s Settings menu, but we picked the ones we feel you’ll enjoy the most. As you know now, not every skin is the same. If you aren’t happy with the default one, don’t hesitate to try out something new. Feel free to share it article across social networks if you think other Kodi users might find it interesting. Also, don’t forget to follow TechNadu on Facebook and Twitter. Thanks!